If you’re looking for a beautiful individual side table, or want to complete a full living room set, you can choose one of our solid oak pedestal side tables. 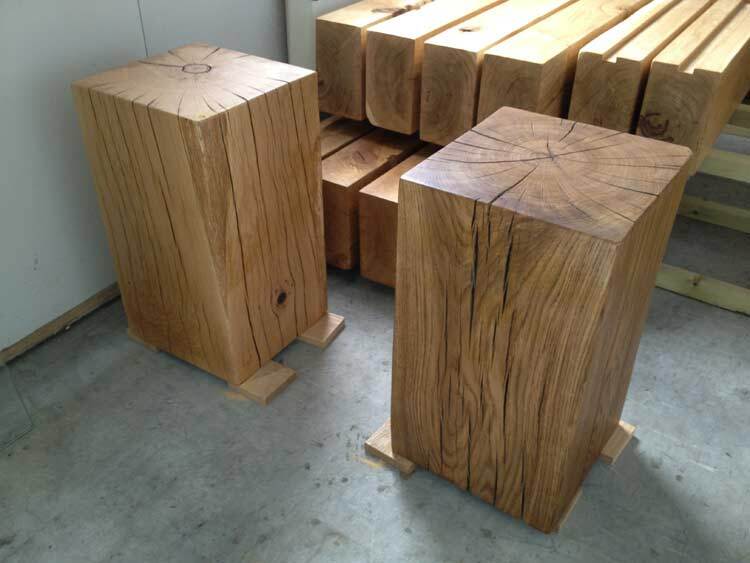 These single blocks of oak are absolutely beautiful to look at because they are so full of character, so we decided to make a single-piece oak cube side table to exhibit this raw organic beauty. 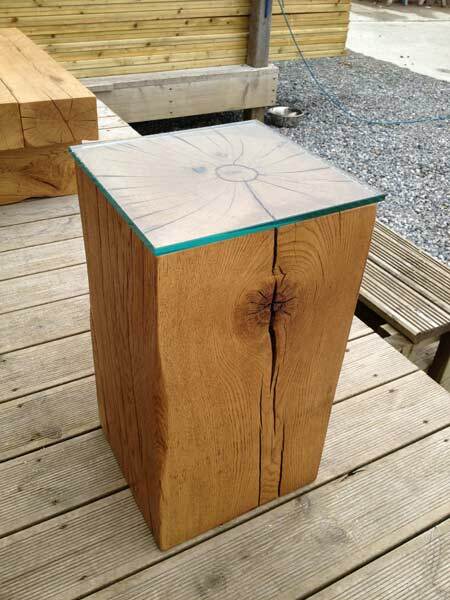 Our oak block side table is as simple and natural as any table could be, just a single piece of oak sculpted and shaped by hand to enhance and reveal every natural feature. These pedestal side tables can be made to any height from timbers of any size, perfect for fitting a room of any size as a compact personal side table. 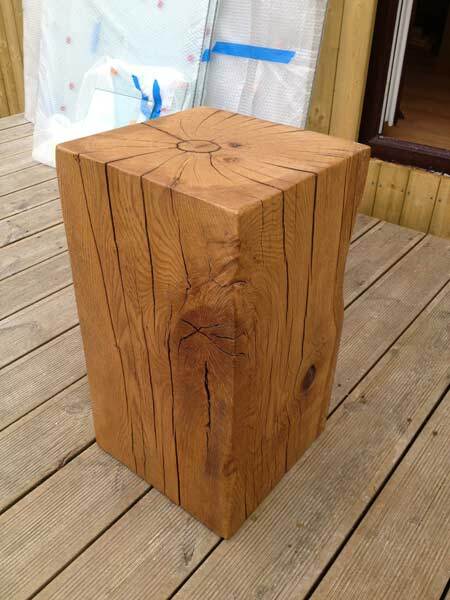 This is our standard large oak pedestal side table which is the perfect lamp table for the living room, made from a single 300mm square beam and finished at 530mm high. But if you have a little less space or just need a convenient spot to put your cup of coffee or glass of wine, we also offer a smaller 250mm square pedestal table, at 530mm high as standard. 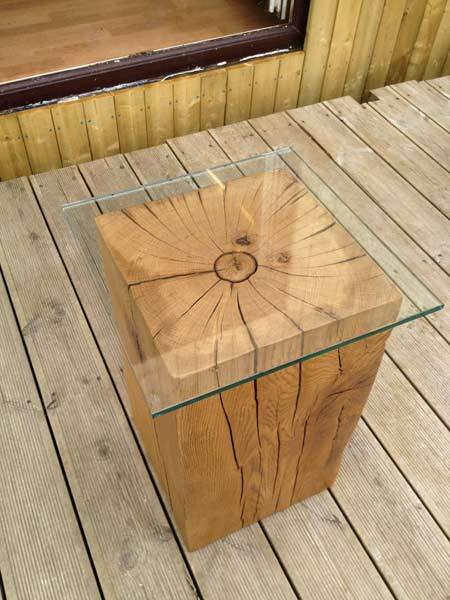 An optional thick toughened glass top means your table has an easy wipe-clean surface, whilst exhibiting the heart of a single tree-trunk below it. 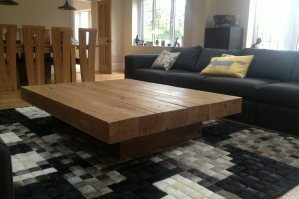 The image above shows a fitted toughened glass top on this table, giving it a contemporary style and protecting the stunning end-grain of the oak beam. You can also add some extra space and practicality on top of your pedestal with a larger glass top as shown in the image below. If you have other tables with a glass shelf, the pedestal glass top ties the set together perfectly. 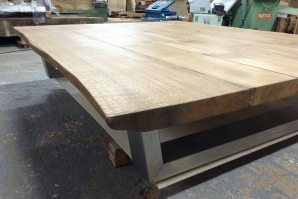 To preserve the beautiful appearance and feel of the oak, your table will be protected in your choice of a durable Natural or Dark Oak finish. This hard wax oil finish has the resilience to protect a solid oak floor so it protects an oak table better from spills and stains than a conventional oil or wax finish. 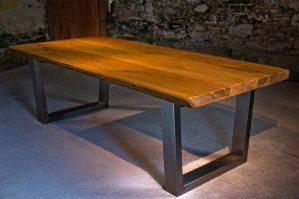 Your table will still have a completely natural look and feel but the durability of the finish means there will be no need to re-coat the table as often as an oil or wax.